If you are a fan of the Jurassic Park™ franchise, you are most likely not averse to trying anything related to it. If you also happen to love playing in online casinos, then you’re in for a treat! Microgaming’s Jurassic Park online video slot game is set for release soon and, this early, it is already creating a lot of positive buzz. For starters, the Jurassic Park video slot retains much, if not all, of the original factors that endeared the world to the movie. There is the jungle environment rendered in rich and detailed graphics. There are the stars or characters rendered in glorious 3D and made even more realistic by exceptional animation. This includes the prehistoric dinosaurs seen in the movie. This time around, however, they’re not creatures to flee from, but to rely on for winning, and winning big. One look at the dinosaurs and players won’t be blamed at all for being in awe. Audio technology has certainly come a long way since the movie was first released in 1993. The sound effects in this game are very impressive and actually even surpass that which was heard from the movie. That’s definitely saying something, since the movie won an Oscar for Sound. Music from the movie will be playing as in-game footage unfolds before the players’ very eyes. There are 5 videos directly taken from the movie, so die-hard fans will definitely have a ball reliving their much-loved film while playing. The rules of Jurassic Park video slot, from the Base Game to the Bonus Features, are easy to get used to, especially for those who are used to playing online slots. Starting at the Base Game, players can then move to the T-Rex Alert Mode, or play any of the five dinosaur-themed Bonus Games. Winning entails forming symbol combinations that are placed side by side, from left to right. It is even possible to have multiple winning combinations per way. With the Scatter symbol, players win something regardless of the position it appears in. While within the Base Game, a T-Rex may suddenly appear behind the Reels on the third spin. Not to worry, because this means that T-Rex Alert Mode has been activated, and the player get six paid spins during the Base Game. In the event that 3 to 5 Scatter symbols appear, the Bonus feature is activated. 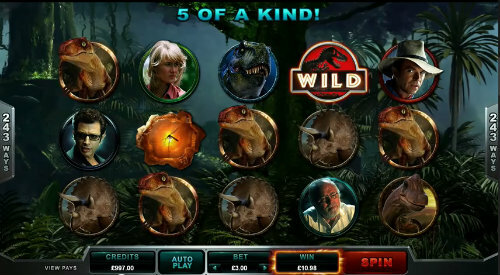 This time, you get 12 free spins, no matter which of the five dinosaur bonuses appear. Of course, each dinosaur bonus has its own distinct feature that will, when used properly, increase your winnings. During the first 25 activation of the Bonus rounds, the game system will choose which dinosaur-themed bonus round will be played. After the 25th time, the player will then get to select the feature that will be activated. 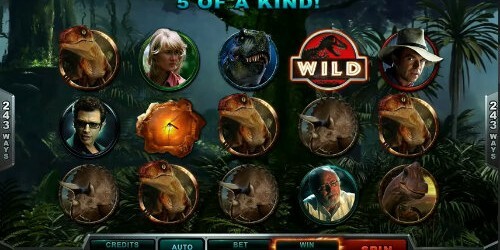 We certainly look forward to when the Jurassic Park online video slot game finally and officially make its way to online casinos. With so many movie- and TV-themed online slot games cropping up, it may be difficult to know which ones are worth playing and which ones aren’t even worth a second of your time. Microgaming’s Jurassic Park online slot, however, is worth playing, and a very much fulfilling and rewarding game.